We don't have too many holiday traditions but this year we've decided to institute a permanent one: we're going to buy a small potted tree and try to keep it in good shape so we can plant it on our property when the ground thaws in the springtime. We should have a forest by the time the kids go off to college! 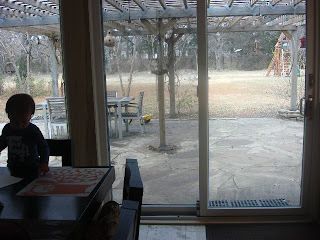 While I was taking these pictures, I realized that I hadn't posted anything about having the ancient windows in our house replaced, so I'm including some photos of our home improvements. (Please excuse the fact that we haven't painted the trim yet.) We got the untempered picture windows replaced with brand new low e insulated glass and our whole house feels so much better. 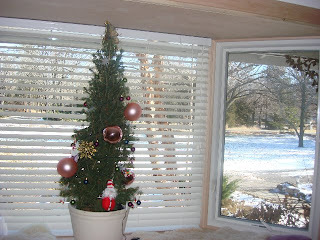 The front window even got a bay popped in, that's where the Christmas tree lives. I love how it opens up our boxy living room and gives us so much light. I think that is a wonderful new tradition you decided upon! Traditions and rituals are the glue that binds families & generations. They create so many memories. You'll watch the trees grow with your kidos and those trees will spark tales of Christmas' back when. BTW I love,love,love the piece hung in the third picture. Love the two animals guys in the pic too, although I have no idea what they are! 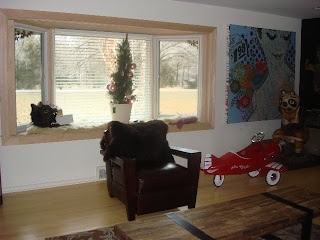 I love big windows - I think your new bay window is gorgeous! We had a new slider installed off of our family room last year and it is so much nicer than evil doors that don't open easily. 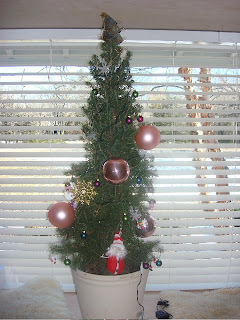 Your new Christmas tradition of the tree and planting it later is awesome! That looks so nice, both the tree and the windows. We really need to do that with our house, since our windows are ancient. It scares me to think of SoJo clawing at them and the paint chipping off. Cool shower curtain too, and you look like you have one fantastic back yard! It'll be even lovelier with all of those Christmas trees. I think that's such a great idea about the trees. It will hold such wonderful memories to come. 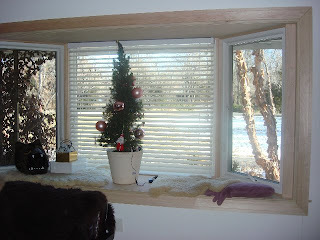 Your tree looks so cute in the new bay window, so perfect! Maybe next year you can get a fig tree or something yummy. Make that grove work for you! I love your tree , what a nice idea. Instead of collecting mere ornaments, you're collecting a forest. The bay window is so nice, all the light it lets in! I imagine the kids spend time sitting there? Happy holidays Naomi, Bob, Roo and Jasper! Hope you get lots of goodies and yummies! Cool idea about planting the tree. You will love the windows. 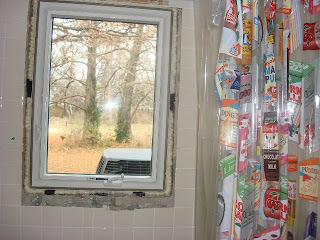 I knew I was a home owner when I practically jumped for joy when we finished replacing all the windows in our house. It makes such a difference. Keep warm! I love your view. It just looks so peaceful.